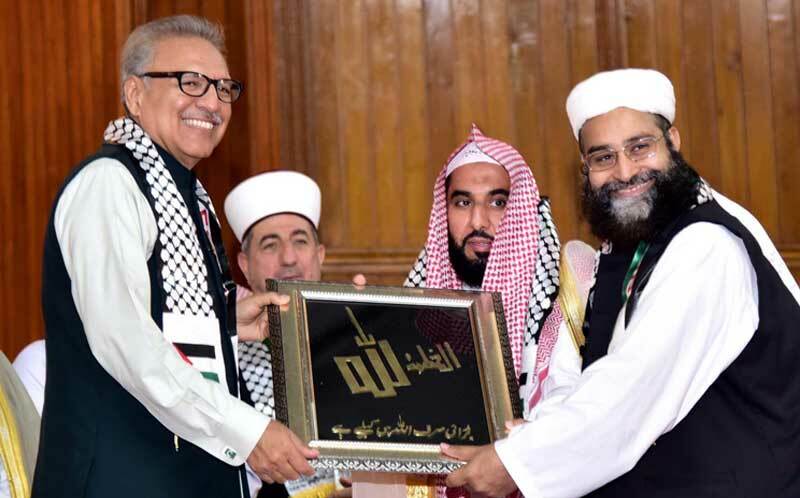 A joint declaration issued at the “Fourth International Message of Islam Conference,” on Sunday, underlined that teachings of Islam had nothing to do with terrorism, extremism and sectarian violence. Islam being a religion of peace and harmony condemns killings of innocent people and also denounces violence in the society. The joint declaration of the “4th International Message of Islam Conference” also pinpointed that Islam is a religion of peace, tolerance and forbearance. Elements responsible for fanning terrorism, extremism and sectarian violence are enemies of Islam and Muslims. The conference also announced to constitute an Islamic Ideological Alliance to contain the mantra of Islamophobia at world level. It was also decided to call a meeting of the leadership of Saudi Arabia, Pakistan and other Muslim countries to finalise the mechanism for this Islamic Ideological Alliance. The Joint Declaration of “4th International Message of Islam Conference” also condemned the brutalities faced by oppressed Muslims of Iraq, Syria, Yemen, Palestine and Kashmir while demanding the Organisation of Islamic Cooperation (OIC) and the UN to take notice of the atrocities. The Conference also lambasted the relocation of the US Embassy in Jerusalem and the occupation of Golan Heights by Israeli Forces as a sheer violation of international laws. The conference announced to support and endorse the oppressed people of Palestine and Kashmir. On this occasion, Pakistan Ulema Council also announced to carry out countrywide campaign for the eradication of terrorism extremism and sectarian violence and lauded role of Pak-Force, government of Pakistan and law enforcement agencies for peace and stability in the country and also appreciated endeavors on part of Pak-Force to crush the militants and armed outfits from Pakistan. The conference also demanded the government of Pakistan to ensure implementation on the National Action Plan in the letter and spirit. The conference lauded efforts of the ruling government to reform the educational structure in the country stating that seminaries, as well as conventional school education system, should be reformed. Registration of Madaris-e-Arabia with Ministry of Education was the best initiative of the country and practical steps in this regard are inevitable. Pakistan was said to be a great force of the Muslim world and the entire Muslim world felt proud of Pak-Force. The conference also lauded retaliation of Pak-Force against Indian aggression stating that the Islamic world will not tolerate any aggression towards Pakistan and the Muslim world will not deviate from any sacrifice for security and defence of Pakistan. The Conference also stated that Muslim Ummah is not negligent with its responsibility for the security and stability of Saudi Arabia. Defence of Harmain Al Sharifain is part of every Muslim’s faith, and no one will be allowed to play with peace and security of Harmain Al Sharifain. Prevailing moves in Europe and the US relating hatred against Muslims and Islam on the pretext of Islamophobia is very condemnable. Ongoing attacks at mosques in the UK, US and other European countries will sabotage the bids for interfaith dialogue and interfaith harmony. The conference announced that faithful of all the religions of the world have rejected these bids, which have undermined the endeavours of interfaith harmony. The Joint Declaration of the conference also urged on UNO to ensure legislation for respect and honour of holy places of all the religions. The joint declaration also lauded the role of Prime Minister of New Zealand Jacinda Ardern stating that world leadership has to learn from her to eradicate the menace of terrorism and extremism from the world. Teachings of all the religions of the world are against terrorism and extremism. Islamophobia is baseless propaganda of terrorists and extremists and believers and faithful of different religions have rejected this nuisance. “4th International Message of Islam Conference” also decided to constitute an effective and systematic mechanism for issuance of decrees. In this regard, “Dar-ul-Afta Pakistan will be established in Lahore, in which religious scholars of different religious schools of thought will serve for the issuance of religious scholars. Dar-ul-Afta Pakistan has been tasked to accomplish its educational and ideological role with the assistance of Saudi Arabia, Egypt and other Muslim countries to resolve the confronting challenges of the Muslim world. “4th International Message of Islam Conference” also announced to carry out joint struggle for interfaith dialogue and interfaith harmony. Believers and faithful of different religions believe that resorting to hatred and violence, any issue can’t be resolved; therefore, the world community should promote the importance of dialogue for interfaith harmony. The conference also pointed out that entire Muslim Ummah has been in the grip of challenges and issues due to foreign interference. Muslim countries from Syria to Libya, Iraq to Yemen and various African countries facing disastrous challenges owing sectarian interference. All the states and countries of the world should respect and honour the sovereignty of other countries and make an end to any assistance to armed outfits and militant organisations making havoc in the affairs of other countries. The conference also lauded strengthening ties between Pakistan and Saudi Arabia stating that bilateral ties between both the Islamic countries will reinforce economic relations. Saudi Arabia has always supported Pakistan in every thick and thin. In recent days, Leadership of Saudi Arabia played a very effective role to diffuse Pak-Indian tension. Services on part of Khadim e Harmain Al Sharifain and Crown Prince His Royal Highness Muhammad bin Salman to serve the Muslims are very encouraging. For services and raising voice for the cause of Muslims, His Royal Highness Muhammad bin Salman has been announced as the favourite personality of the Muslim World for the year of 2018. The conference also lauded the services of Pak-Force against the menace of terrorism and extremism and announced to confer shield for Pak-Force on behalf of Imam-e-Kaba Al-Sheikh Abdullah Awad Al-Juhany and Chief Justice Shariah Court Palestine. The conference also urged on all the confronting groups of Afghanistan to come to negotiations and lauds role of Pakistan, Saudi Arabia and UAE for peace talks between the Afghan Taliban and US. A resolution adopted at the conference urged on the Muslims of Europe and the USA to educate their youths with basic teachings of Quran-O-Sunnah to rescue them against the propaganda of terrorists and extremists organizations. Muslims scholars and clerics were also demanded to play their effective role to educate Muslim youths against prevailing conspiracies against Muslims and also foil the conspiracies against Harmain Al Sharifain. Another resolution adopted at the conference also resolves to contain the elements making propaganda on the issue of Finality of Prophethood. The government of Pakistan has been urged to include the column relating believe on the finality of Prophethood in Hajj Umrah Visa forms as Qadiyani Leader Mirza Masroor wants to seek permission for Qadiyanis to visit Mecca and Medina. Another resolution adopted at the conference underlined that any organisation or individual wouldn’t be allowed to do politics on the belief on Finality of Prophethood. Extra-judicial murders of any Muslim or non-Muslim residing in Pakistan can’t be announced. Believers of any specific religion and religious sect can’t be announced an infidel. Believers and faithful of all the religions are allowed to live in Pakistan as per their traditional norms. The conference demanded of Federal Minister for Interior Sheharyar Khan Afridi to ensure implementation on National Action Plan in the letter and spirit. The government also urged to keep a check on hateful content being propagated on social media. Non-Muslims also lives in Pakistan; therefore, it is the responsibility of Muslims as per Islamic Shariah to ensure the protection of properties and holy places of non-Muslims.